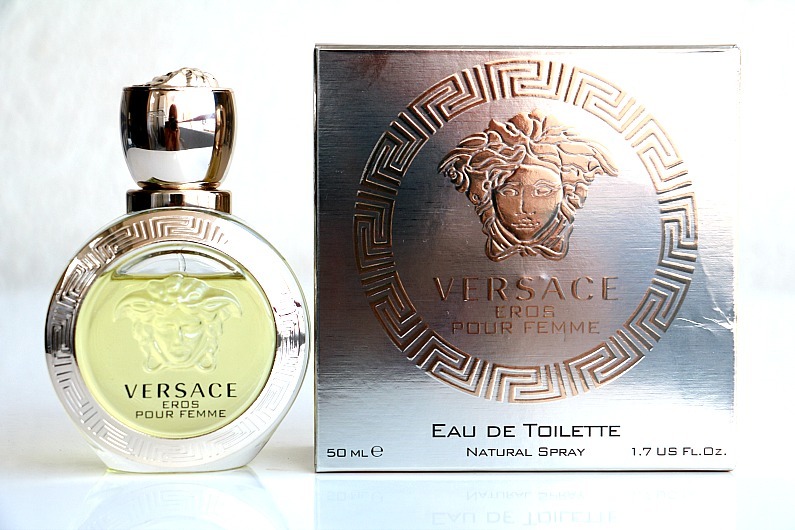 This blog post was supposed to be the review of Dylan Blue, the latest fragrance by Versace. I had tried it a few months before and liked it very much. As I was travelling on holidays from the Larnaca Airport last month, I remembered it and decided to buy it at the duty-free shop. 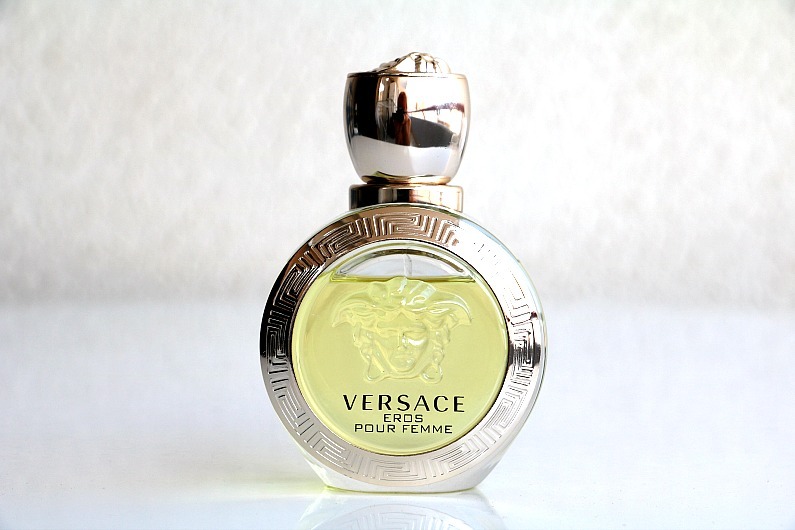 Once I was in front of the Versace stand, my attention was drawn to the beautiful, luxurious bottle of Eros Pour Femme. It was a round bottle with the gold Medusa symbol in the central part and on the lid edged with the gold Greek fret pattern. I could not remember if I had tried it before, so I sprayed it a little on my wrist. It was love at first sniff! The scent was a mixture of fresh, citrusy notes and musky notes and this was perfectly balanced. Before I knew it, it had already been in my basket. I completely forgot about Dylan Blue. Eros Pour Femme was launched in December 2014. 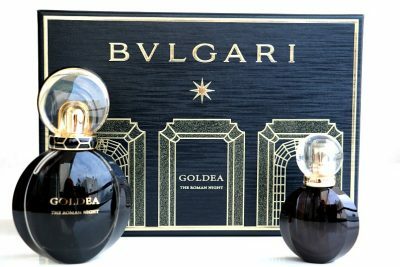 The perfumers who had created it are Alberto Morillas, Olivier Cresp and Nathalie Lorson. The fragrance opens with citrusy notes of Sicilian lemon, Calabrian Bergamot and pomegranate. Lemon , sambac jasmine and peony are at the heart of this perfume while sandalwood, ambrox, musk and various woody notes make the base. It is similar to the Light Blue Italian Zest by Dolce & Gabbana, but Eros is deeper and sweeter. 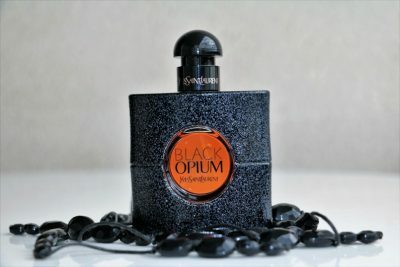 It is very refreshing and uplifting and at the same time it is very mysterious, sensual and seductive because of its woody and musk notes. The scent is long lasting in a way that it can still be smelled subtly on your wrists after several hours into wear, but it should be reapplied a few times during the day if you really want to feel it. It is perfect for spring/summer time and it is suitable both for day and evening wear. 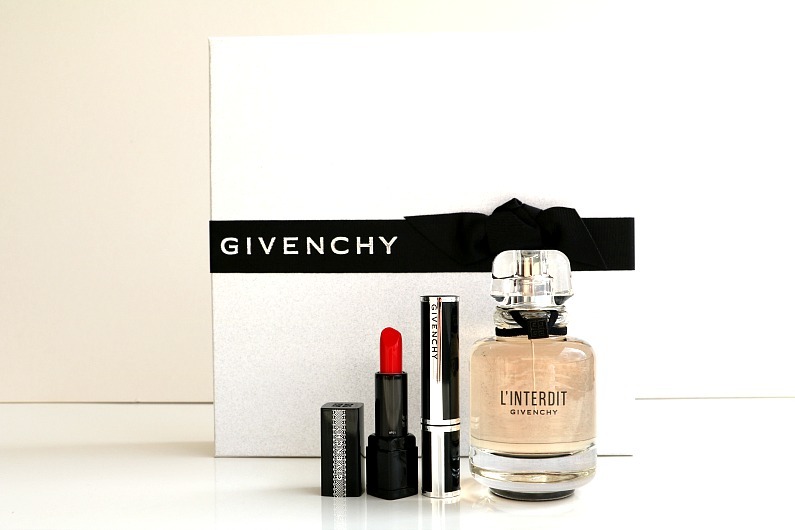 The fragrance is available as 30ml, 50ml and 100ml Eau de Toilette and Eau de Parfum. The price for a 50ml bottle EDT at the Larnaca Airport duty-free shop is 66,00EUR. 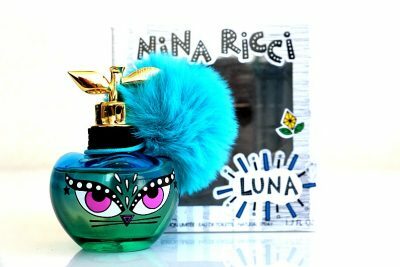 Last month I was travelling to Scandinavia and as I was killing my time in the duty-free shop at the Larnaca Airport, my attention was immediately drawn to the Nina Ricci stand. Among all the beautiful, elegant bottles of various fragrances, two of them were standing out. They were adorably monstruous. One was featuring a cat and the other an owl. Each one was with a fluffy brightly coloured pom-pom around the bottle neck. These are Les Monstres de Nina Ricci, limited edition fragrances released in January this year. The famous Nina (from 2006) and Luna (from 2016) scents from Les Belles de Nina range have been repackaged. Brazilian artists Ana Strumpf and Guto Requena have transformed the iconic apple bottle into cute little monsters. The scents have had a bit of a remix as well. The perfumers, Marie Salamagne and Christophe Raynaud, are behind Luna and Nina was created by Olivier Cresp. As I am obsessed with anything cat-themed, I bought Luna. The Luna bottle is blue, featuring a cat’s face with protruding pink eyes and a detachable fake fur blue pom-pom around the neck. The fragrance itself is a combination of fresh, fruity aroma of pineapple juice and lime at the top notes, creating a bright and sharp opening which is followed by the floral heart notes of freesia and orange blossom. The base notes of caramel and blond woods are those that prevail, once the scent sets on your skin. 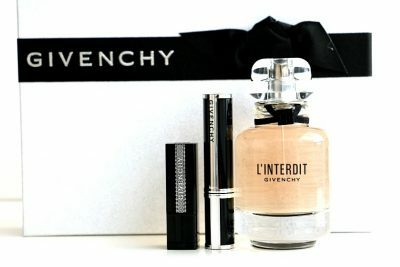 The fragrance is not overwhelming and it can be worn day and night all year around, except in the summer in my opinion. The longevity is below average and you will have to reapply it often. We all have our little inner monster and Nina Ricci is urging us to liberate it! Therefore, the hashtag of the advertising campaign is #freethemonster. 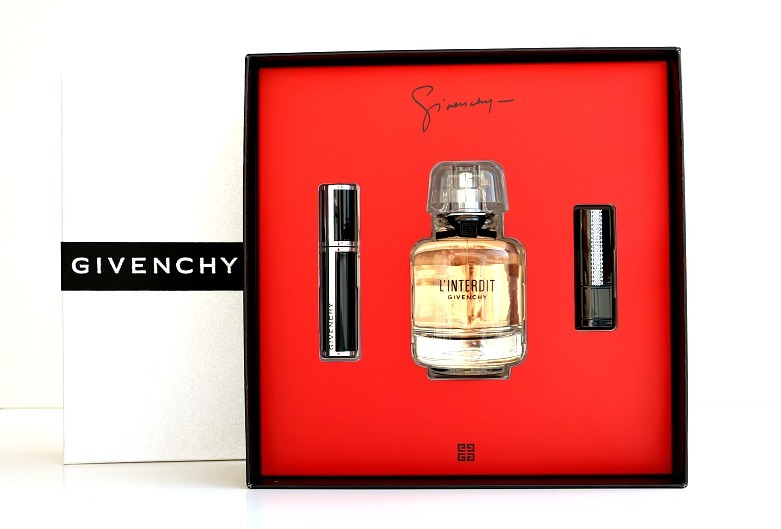 The fragrance is available as a 50ml and 80ml Eau de Toilette. The price for a 50ml bottle is 57,00EUR at the Larnaca Airport. Decadence by Marc Jacobs was launched in 2015 in collaboration with the perfumers Annie Buzantian and Ann Gottllieb. 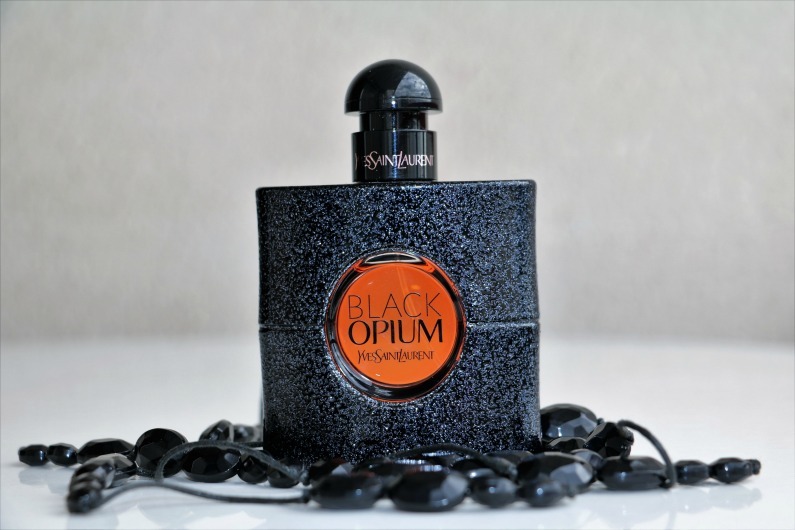 This is a sensual, sophisticated, luxurious, warm woody scent which seduces with the top notes of Italian plum, golden saffron and iris flower, Bulgarian rose, jasmine sambac and orris at the heart of the perfume and warm amber, vetiver and papyrus wood at the base. The rich and elegant composition is addictive and leaves a strong and unforgettable impression. 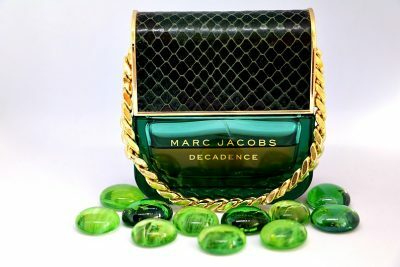 The emerald-green bottle with python pattern cap and gold chain is inspired by one of the iconic classic Marc Jacobs’ handbags. A black tassel hangs from the chain on the caps of the 50ml and 100ml bottles. The bottle can be carried by the chain as the magnet keeps the cap and the bottle tightly together. The longevity of Decadence is very impressive. Although the fruity notes disappear around an hour into wear, the warm amber lingers for hours after that. 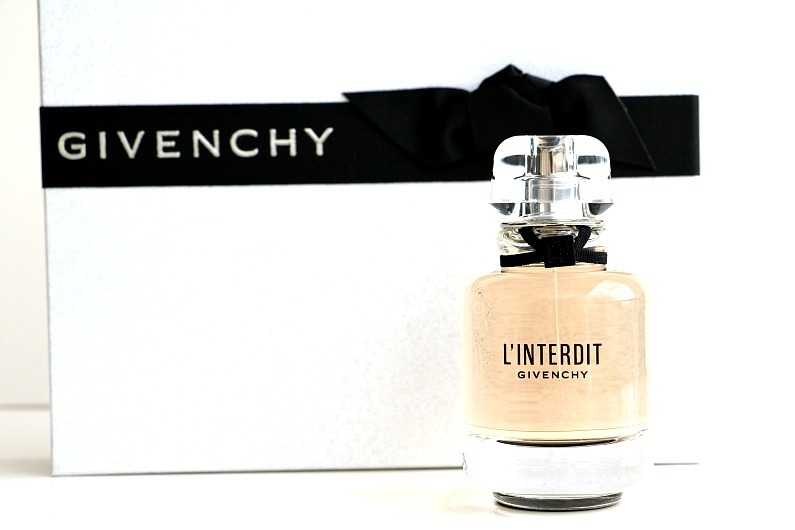 This perfume can be worn all year around as a night time scent and as a day time scent during cooler temperatures. It is perfect for every occasion. Decadence is distinctive, seductive, memorable and it is the ultimate statement maker. The face of the campaign is Adriana Lima. The fragrance is available as 30ml, 50ml and 100ml Eau de Parfum. The price for a 50ml bottle is 97,00EUR at Beauty Line Cyprus.